Egyptian authorities are intending to use the holy places of three world religions on the Sinai Peninsula to development pilgrimage and excursion-educational tourism, according to South Sinai province governor Khaled Foda, reports RIA-Novosti. “Sinai is the cradle of three world religions; it embodies the spirit of peaceful coexistence of representatives of different faiths,” Foda said, speaking at an international conference on the development of religious tourism. According to Deputy Minister for Antiquities Affairs Muhammed Abdel Latif, the first Muslims passed through Sinai to Egypt, and the first pilgrims on the way to Mecca and Medina used paths through Sinai. The Sinai territory also has historical mosques and ancient Muslim fortresses he noted. He also added that St. Catherine’s Monastery on Mt. Sinai, also known as Moses’ Mountain, is an important religious site. Moses spoke to God, receiving the Law atop Mt. Sinai, where today stands an Orthodox church and a mosque. The area includes many other religious “attractions,” including the ancient Baths of Moses, the tomb of the holy prophet Aaron, and the cave of St. John Climacus. Head of the State Committee for Tourism Development Khisham ad-Dumari told RIA-Novosti that the government is ready to help in the development of religious tourism on the Sinai Peninsula. “With regards to religious tourism, the state’s role will be to ensure the necessary conditions. In particular, we will, for example, ensure that there will be a good road leading to St. Catherine’s Monastery, that there will be an airport, and good hotels. Tourist companies should include these sights in their service packages,” said al-Dumari. “Sinai has very many monuments that are important for Muslims, Christians, and Jews, and we want the whole world to know about it,” concluded the Egyptian representative. The term “Bedouin” in the Arabic language refers to one who lives out in the open, in the desert. Eutyches, the ninth century Patriarch of Alexandria, writes that when Justinian built the monastery, he settled next to it some two hundred families brought from the Pontos of Anatolia, and from Alexandria, in order to guard, defend, and assist the monks. The modern-day Bedouin are considered to be the descendants of those families that converted to Islam in the seventh century, and today form the Sinai Bedouin families that make up the Jebeliya tribe. Its members, to this day, trace their lineage to these soldiers as part of their cultural identity. The monastery is an integral part of their lives and has always respected their rights. They are peace-loving and hospitable in spite of the widespread poverty in the region. The Bedouin participate in the life of the monastery both through their work, and through involvement in its everyday life. Instrumental to its unbroken history of peace with its Bedouin neighbors is the Sinai Monastery’s emphasis on personal freedom based on tolerance through non-judgment of others. The Sheikh of the local Jebeliya tribe was quoted in the Egyptian press, saying "The peace that has existed between the monks and the Bedouin people has made Sinai an emblem of peace" that has served pilgrims and visitors of different faiths, languages and cultures. According to tradition, the founder of Islam, Mohammed, received hospitality from the Sinai monks, and The Koran mentions the Sinai holy sites. In the second year of the Hegira, corresponding to AD 626, a delegation from Sinai requested and later received a letter of protection from Mohammed stamped with his handprint. In AD 1517, Sultan Selim I confirmed the Monastery's exclusive rights, but transferred the original document to Constantinople. As part of its philanthropic work, in the 1980’s and 90’s, the Monastery built new medical and dental clinics, including donated state of the art laboratory equipment, which for years have provided free treatment to anyone seeking help, whether Bedouin, visitor, or monk. As a diverse nonprofit, FMSM is called to be all things to all people. 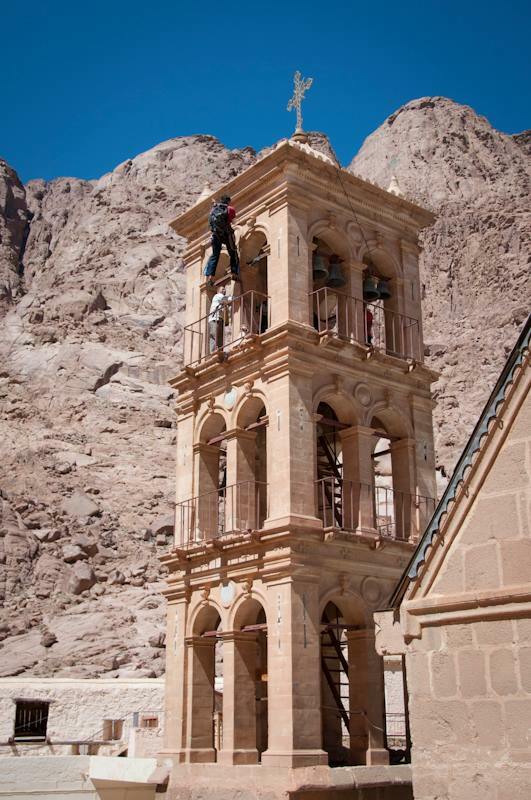 And thus, to all outdoor enthusiasts, FMSM would like to announce that Saint Catherine’s Monastery has now been rock climbed. The Monastery’s much vaunted peaceful history does not mean that it was never threatened. Various and sundry wished it less than a long and successful future. But until now it had never been invaded by extreme sports (not counting an occasional football [soccer] match between Bedouin teenagers and a passing monk or two). How many noticed through FMSM’s intrepid monastery coverage that for years however, the bell tower has been missing one of the small crosses that adorn each of its four corners? No one knows what happened to it. But the Monastery was recently visited by a Russian pilgrim who lives in Dahab. He works with wind surfing aficionados in the winter. In the summer, he heads to Azerbaijan or Central Asia, where he leads climbers into the high mountains. He is an excellent rope climber. Back in February the pilgrim used his skills to climb to the top of the tower and where he took an impression from one of the existing crosses. Then he removed the base from the missing cross. He made a reproduction of the missing cross, which Father Daniel was then to attach to the base in his metal shop. Then he planned to climb up once more, and put it in place. "Michael the Russian has worked as a guide for trekking into the high mountains of Kyrgyzstan. With his advanced rope climbing skills, we were able to replace the cross on the front right corner of the bell tower." Our prayers go to you. What Do Monks and Mountain Climbers Have in Common? 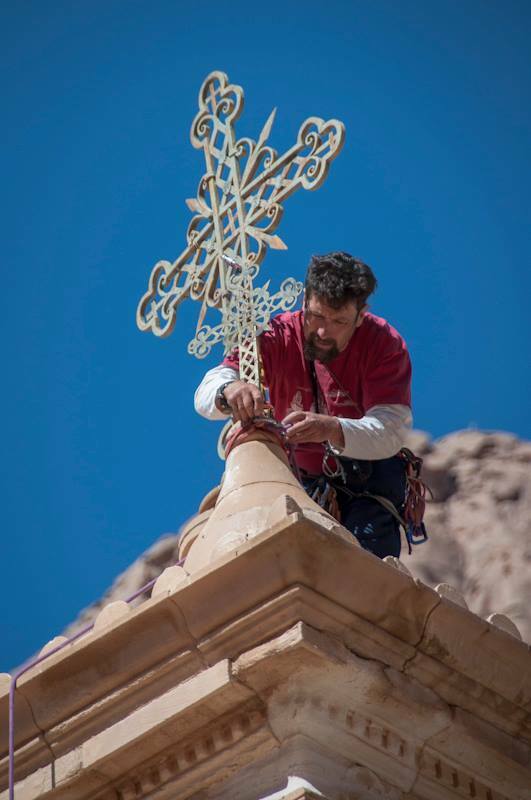 These unique pictures of the recent "elevation of the Cross" on top of the bell tower of Saint Catherine's Monastery were generously provided by Michael, the mountain climber from Russia. He and his family live on the Sinai coast of the Red Sea. They are a part of the Russian community there and good friends of the Monastery. Photographs are by Anna, his wife. The ornate Monastery bell tower itself dates back to the 1870s and has nine Russian bells donated by the Russian Emperor Alexander II for its construction. The sound of the bells can be heard throughout the peaceful valley early in the morning, ringing the glory of God at the Great Doxology to announce the daily Divine Liturgy at the Monastery, as well as at night on the feast days, celebrated with the all-night Vigil.